Laurie is a poet from Canberra who performs regularly at dinners, functions and festivals and wherever he can find an audience. He writes of quirky observations of life from the humorous to the serious and his poems feature a range of larger than life characters such as Merkyl Crud, Thommo, Mick, Candy Divine and Jimbo. He also includes traditional poets Banjo Paterson, Henry Lawson and others, along with several modern poets in his performance repertoire. Poetry came into Laurie’s life in 1992 when he wrote a poem for a family function and the muse has continued to the present day. 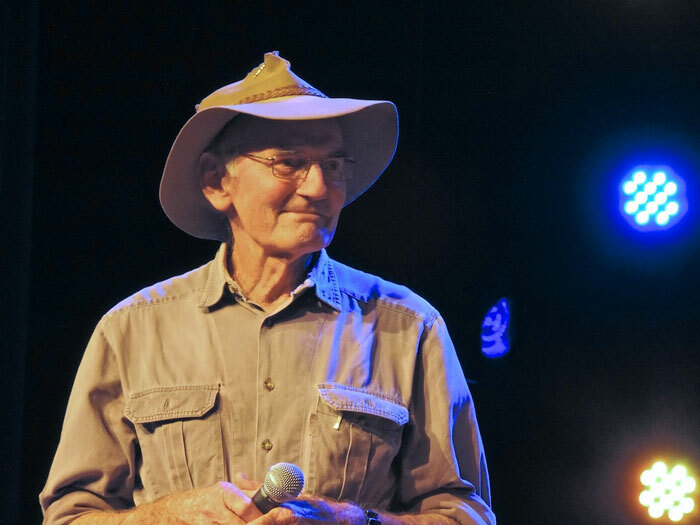 He became a foundation member of the Queanbeyan Bush Poets and has been writing and performing ever since. He doesn’t normally get to competitions, but has snuck a in a couple of awards when he won the Reciter of the Year at the 2007 National Folk Festival in Canberra and the Tuckerbox Reciters Award in 2011 in Gundagai. Laurie is married to Denise Burton, herself an accomplished and entertaining free verse poet and their ‘combined’ rendition of Roald Dahl’s ‘Little Red Riding Hood’ has become legendary. In late 2012, Laurie recorded the CD Laurie McDonald Live…at The Murrumbateman Pub which features mostly his own poems. Born in Allora, he spent the first 25 years of his life in Queensland. As his father was a primary school head-teacher, the family, including his mother, five brothers and a sister moved regularly with each of his Dad’s transfers. During that time, Laurie lived on the Darling Downs, in Emerald, Maryborough, Brisbane and Mt. Isa. After completing a Surveying Degree at the Uni of Queensland, he moved to Wollongong for five years and then to Canberra in 1973, where he worked as a surveyor until retirement in 2009. One of Laurie’s other loves over the years has been sailing, hence The Legend of Merkyl Crud, a poem about a hero who ‘wins’ the Sydney–Hobart race. During the 1970s he won several national and state championships in catamarans with his late first wife Dianne. From 1984 he raced windsurfers, and following considerable lack of success, became a race official and during the 2000 Olympics officiated at the Sydney Olympic Sailing Venue as a boat measurer and in the race results room. These days Laurie’s spare time includes another of his loves, gardening, with a preference for Australian natives, but writing and performing remain high on his agenda. Laurie also sings bass in the Canberra Celtic Choir which sings, in two and four part harmonies, in English, Welsh and Gaelic, and has also sung harmonies on the CDs of his brother Ken McDonald, a Brisbane singer/songwriter.